A new paper reports the discovery and characterization of a new iron-rich high-pressure mineral named for EFree Director Russell J. Hemley in recognition of his distinguished contributions to high-pressure research and mineral physics. 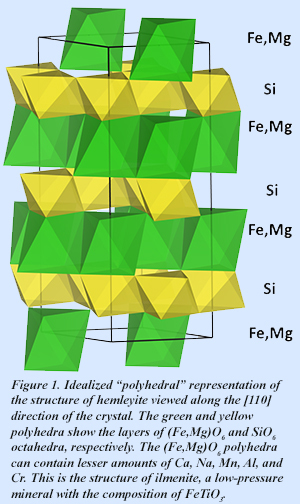 The new mineral is the iron-rich analogue of akimotoite, a mineral with MgSiO3 composition and having the ilmenite structure (Fig. 1). Until now, the Fe-rich analogue of this mineral had not been observed in nature. The new paper reports discovery of the Fe-rich mineral in a heavily shocked meteorite, the L6 Suizhou chondrite. The composition of the mineral characterized in the meteorite is (Fe2+0.48Mg0.37Ca0.04Na0.04Mn2+0.03 Al0.03Cr3+0.01)SiO3. The ideal composition of hemleyite is FeSiO3. The study reported that the portion of the meteorite containing hemleyite experienced pressures of approximately 20 GPa (200,000 atmospheres) and temperatures of 2000 oC when it was shocked. These pressure-temperature conditions correspond to those that exist at the base of Earth’s upper mantle, which suggests that hemleyite exists within the Earth and could be responsible for features observed by seismology at roughly 600 km depth. A complete description of the structure, composition, and other physical properties is published in the new paper [L. Bindi et al., Sci. Rep. 7, 42674 (2017)]. Prior to publication, the International Mineralogical Association had approved the new mineral and its naming hemleyite.